Security gaps like Meltdown and Spectre show once again that relying on the standard security mechanisms of hardware and operating system is not enough. For distributed IoT devices in particular, installing patches is a hardly solvable task; the risk of data loss is tremendously high. 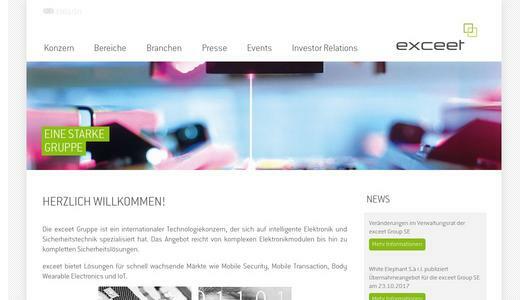 exceet Secure Solutions GmbH, an exceet Group company offers the solution with exceet connect. With the highly secure solutions from the exceet connect architecture you are optimally prepared for such scenarios. exceet connect TRUST in conjunction with the exceet Gateway creates manageable trust spaces that enable secure communication. With the hardware-based encryption via Secure Element on the gateway, a second line of defense is realized, which works independently of other hardware mechanisms such as CPU and thus also prevents attacks like Meltdown and Spectre. In addition, exceet connect offers the complete system maintenance: secure update mechanisms, encrypted file system on the gateway, remotely manageable Secure Element - Trusted Ecosystems from exceet. exceet Secure Solutions specializes in secure connectivity solutions and offers software, hardware, consulting, and services in this field. The company focuses on IoT solutions and IT security, with special expertise in industry and health. The portfolio also extends to hardware security modules (HSMs), PKI solutions, as well as products and services for qualified signatures and timestamps, including Trust Center operation. exceet is an international technology corporation specializing in the development and manufacture of intelligent, complex and secure electronics.